President Carlos Alvarado Quesada has set out to make Costa Rica the first zero-emissions country as the threat of climate change continues to increase. Costa Rica’s small population of roughly 5 million is not a large contributor to the world’s climate crisis. Therefore, the President received backlash when he announced his ‘Zero-Carbon Plan’ back in February. The decarbonation plan is narrowed to four sectors: agriculture, waste management, industry, and transportation. At the plan’s launch, Alvarado addressed the skeptics.“We can be that example – we have to inspire people,” he says. He is hopeful that his country will serve as a model for other countries with high emission rates such as the United States, China, and India. While some may describe the President’s plan as somewhat Utopian and unrealistic, Alvarado wants to prove his country can gradually zero out carbon and toxic emissions. Alvarado’s first endeavor will be switching the country’s transportation sector to run on electricity instead of fossil fuels. Nearly 60% of Costa Rica’s emissions are transport related according to the National Meteorological Institute. Two new electric trains, one for cargo transports and the other for passengers, are set to be installed in 2022. Electric automobiles will see tax cutbacks in an attempt to increase their circulation in urban areas. The President also intends to replace public buses with those that can run on biofuels. Costa Rica has already taken steps towards maintaining a clean and sustainable environment. 99% of the country’s electricity relies on renewable sources due to its geographical features. All of the logistics and details of the decarbonation plan are not yet sorted out. “To be straight we don’t have the fix yet,” Alvarado said. The President acknowledges that the cost and implementation are not concrete and are subject to change. Despite Costa Rica’s small scale of impact in the grand scheme of climate change, Alvarado is determined to oversee a successful outcome for his country and motivate similarly sized constituencies around the world. He believes it is a mistake to focus solely on the actions of large countries and depend on their leaders. Instead he wishes to see the mobilization of smaller populations that will encourage other nations to follow suit. 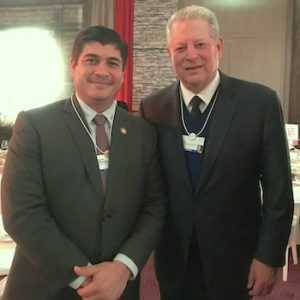 President Alvarado has made it clear that he wants to take action against global warming and set a high standard for the rest of the world with his green economy. Rarely do we come across a success story in terms of combating climate change, Alvarado is hoping his country will become one.